Prompt action of the Assam Rifles claimed to have saved the village from wildfire in the northeastern state of Manipur, according to Assam Rifles sources. 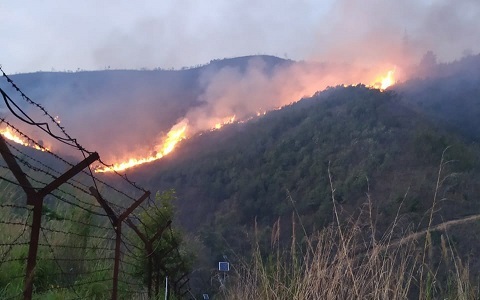 On April 11, at around 5 pm a vigilant sentry in one of the duty posts of Pallel Garrison of 26 Sector Assam Rifles spotted a wild fire approaching the parameter of the garrison and a nearby Meipou village, PRO Assam Rifles (South) stated in a press release issued on Saturday. Swift wind and already spread out dried leaves/haystack further caused the fire to spread quickly beyond the control of villagers. “Responding promptly to the situation, two teams led by officers rushed and reached both the locations simultaneously,” it said. “The team cordoned the area immediately to ensure the safety of civilians followed by controlling the wild fire with all available fire fighting equipment,” the release further stated. Three water bowers with pumps and pipes were quickly pressed into service and were stationed near the garrison parameter to control the wild fire. By 10.30 pm in the night, troops were able to control the situation. Timely and prompt action of the troops of Assam Rifles saved the village from getting engulfed by wild fire, it added. The fire rescue mission received an overwhelming response from the villagers and gratitude from the village chief, it further stated.